My husband and I had a long week at work and typically on a Friday night, we share a great bottle of wine. 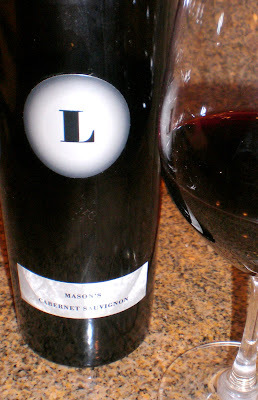 I hunted in the cellar and pulled out the Lewis Cellars “Mason” Reserve – 2003 Cabernet Sauvignon. It certainly exceeded our expectations. Lewis Cellars is a small family winery established in 1992 by Debbie and Randy Lewis, and recently their son Dennis joined the family business. The total production is somewhere between 8,500 and 9,000 cases and highly sought after by collectors. Randy was a professional race car driver and Debbie had many years of experience in the wine business from wholesale marketing to retail management in a wine bar. Wine spectator consistently scores between 90 and 95 point rating from Wine Spectator magazine. This release is filled with fruity layers of ripe raspberry, plum, dark cherry and espresso flavors combined with a hint of black truffles and soft tannins. I tasted a hint of cedar and tobacco. This was a “divine” wine!